You will receive a step-by-step instruction that will bring you to the desired relationship.. The founder of the "Super Ego" international company. The author of the Master Kit method for comfortable achievement of goals. 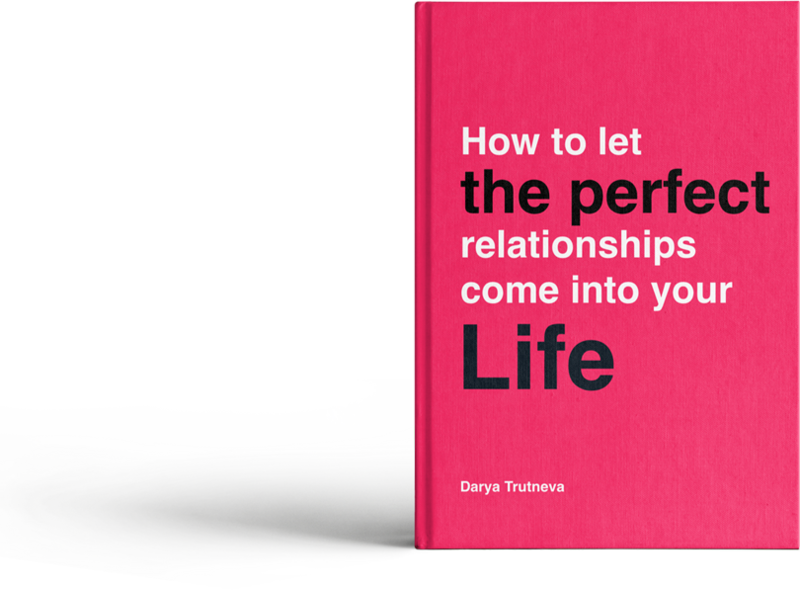 The author of the books: "How to let the perfect relationships flow into your life" and "How to let big money flow into your life"
1.1.1. “The Website Administration” – the authorized employees, who oversee the website. They act on behalf of the company, and organize or/and perform the processing of the personal information, as well as determine the purpose of the processing the personal information, the composition of the personal data, which is having to be processed, actions (transaction), that are made with the personal information. 1.1.2. “Personal Information” – any information, that directly or indirectly refers to a certain individual (the subject of personal information). 1.1.3. “The Processing of Personal Information” – any action (operation) or the number of actions (operations), that are made with or without the automation tools with personal information, including collecting, recording, systematisation, accumulation, storage, clarification (updating, modification), extraction, use, transfer (distribution, provision, access), depersonalization, blocking, deletion, and destruction of personal data. 1.1.4. “The Confidentiality of Personal Information” – mandatory to follow by the operator or anyone, who gets access to the personal information. The requirement is to do not allow the distribution of the information without the consent of the subject of personal data or other legal grounds. 1.1.5. “The Website User” – an individual, who has access to the website and uses the website store, through the Internet. 1.1.6. “Cookies” – the small fragment of the database, that was sent by the web-server. This fragment stored on the person’s Personal Computer, and the web-client or the web-browser is able to send it to the web server in the HTTP request every time when the web-client or the web-browser tries to open the page of the corresponding site. 1.1.7. “IP- address” – the unique network address of a node in a computer network and is built using the IP protocol. 2.4. The website administration does not verify the authenticity of the personal data provided by the user of the site. 3.3.1. The disconnection of cookies may result in the inability to access parts of the website that require authorization. 3.3.2. The website collects statistics about the IP-addresses of its visitors. This information is used to identify and solve technical problems and to control the legality of financial payments. 4.1.1. The identification of the User, who is registered on the website, the placing of an order and (or) for signing a purchasing contract through the remote mode with the company. 4.1.2. Giving the User an access to the personalized resources of the website. 4.1.3. The establishment of feedback from the user, including sending notifications, concerning requests for the use of the website, providing services, processing requests and applications from the user. 4.1.4. Definitions of the location of the user for security and the prevention of fraud. 4.1.5. Confirmation of the authenticity and the completeness of the personal data provided by the ser. 4.1.6. Creating an account for making purchases, if the user has agreed to create an account. 4.1.7. Notifying the user of the website about the status of the order. 4.1.9. Providing to the user an effective client and technical support in case of problems related to the use of the website. 4.1.10. In case of the User consent, providing product updates, special offers, information on prices, newsletters and other information on behalf of the website. 4.1.11. Implementing advertising activities with User consent. 4.1.12. Providing an access to the User on websites or services of partners with the purpose of reception of products, updating, and services. 5.1. The processing of the User's personal data is carried out without any time limits, in any legal way, including personal information systems, with or without using automation tools. 5.2. The User agrees that the website administration has the right to transfer personal data to third parties, including courier services, postal service organizations and telecommunication operators. This is exclusively for the purpose of fulfilling the User's order, the checkout on the website, and the delivery of the product. 5.3. The personal data of the user can be transferred to the authorized organizations of the government of the Russian Federation only on the sufficient base and in the order, that was established by the legislation of the Russian Federation. 5.4. In case personal data is lost or, divulgated, the website administration will inform the User about the matter. 5.5. The website administration takes necessary organizational and technical actions to protect the personal information of the User from an unauthorized or accidental access, destruction, modification, blocking, copying, distribution, as well as from other illegal actions of third parties. 5.6. The website administration together with the User takes all necessary actions to prevent losses or other negative consequences caused by the loss or divulging of the User's personal data. 6.1.1. Provide information about the personal data, that is necessary to use the website. 6.1.2. In case of changing the information to update, complement the provided information about personal data. 6.2.3. To take actions to protect the confidentiality of the User's personal data in accordance with the procedure, that is normally used to protect such information in the existing business. 6.2.4. To block personal data related to the relevant User from the moment of a request of the User or his legal representative or authorized body for protection of the rights personal data for the verification period, in case of revealing unreliable personal data or illegal actions. 7.2.1. Becomes public property before its loss or disclosure. 7.2.2. It was received from a third party before the moment it was received by the website administration. 8.1. Before recourse to the court with a claim about disputes, that were raised from the relationship between the User of the Internet store website and the website administration, it is mandatory to file a claim (a written proposal for voluntary settlement of the dispute). 8.2. The receiver of the claim within 30 days from the date of receipt of the claim, must notify the applicant in writing about the results of the examination of the claim. All personal information given by you when registration to our website could be changed or completely removed from our database by your request. To do this, you need to contact us by any applicable and convenient method to you using the contact information provided in the designated section of our website. If you want to stop receiving letters from our regular email alert service, you could do it at any time, using the special link that is provided at the end of each email.